Previous image, 56 total items. Next image, 56 total items. An unforgettable, worry-free trip begins with being aware of a little information about your destination. It's time to acquaint yourself with the basics about Hannover! Hannover is the capital of Lower Saxony and is about 60 miles (97 kilometers) southeast of Bremen, a prominent city. It's an area of Lower Saxony that some 500,000 people call home. Organize your Hannover accommodation and flight package via Travelocity, and watch the savings roll in. With no less than 400 airlines and 665,000 accommodations, you've got a world of options. Our Customer 1st Guarantee gives you the security of 24/7 personal assistance on everything from flights and accommodations to car rentals and activities. If you notice a cheaper price on a different site, we will refund the difference^. If you decide to cancel or reschedule your reservations for any reason at all, there won't be any hidden fees from us. And so long as you get in fast, many accommodations won't charge you either^. With so many accommodations in Hannover, finding somewhere to lay your head is simple. Choose from 128 properties available through Travelocity. Before you know it, you'll be discovering the real essence of Lower Saxony's state capital! It's not every day you take off on vacation, so why not treat yourself to a bit of luxury? 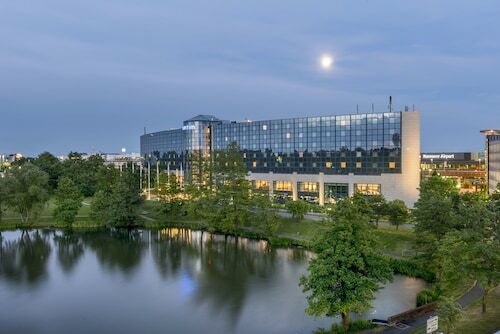 The MSR Hotel (Baumschulenallee 6) and the Wyndham Hannover Atrium (Karl-Wiechert-Allee 68) are some of the top upmarket properties in Hannover. If you'd rather spend your vacation budget on amazing Hannover experiences, make a reservation at the HAHNE´S GÄSTEHAUS (Rethener Kirchweg 6) or the Arcadia Hotel Hannover (Karlsruher Strasse 8a). Where do you fly into for Hannover? Get set for some amazing new experiences! The heart of Hannover is just 6 miles (10 kilometers) south of Hannover Airport (HAJ). Can I rent a car in Hannover? Don't bother waiting for buses and trains. Check out the car rental options via Travelocity and get the most out of your stay in Hannover. If your flight lands at Hannover Airport, you can just about rent a car on the tarmac. Check out Sixt and Europcar. Renting a ride from the middle of the city is a convenient option if you're staying nearby. Look into Sixt, which you can find at Georgstr 50. If there isn't anything that you like there, Europcar at Ernst-August-Platz 1 is another good option. So many places to see and so little time. If you want to discover what the city has to offer, add New Town Hall and Marktkirche to your travel schedule. If you have an extra day, try to swing by the Great Garden and the Schuetzenplatz too. You don't need to know what soprano, singspiel or soubrette mean to relish a night out at the opera. Get spruced up and be spellbound by thrilling performances and compelling drama at Opera House. Want some more options? History has many lessons to teach. Soak up the knowledge and become more familiar with times gone by at Historical Museum. And there's more. University of Hannover has long been fertile ground for fresh ideas, groundbreaking research and leaders of the future. See if it's possible to traipse through its historic halls and mingle with students during a guided tour. Explored the best of Hannover itself? If you have more time to spare, there's heaps more to keep you busy in the surrounding areas. You might be unaware that you're only 55 miles (89 kilometers) from Leeste. It's the perfect starting point to access the Kunsthalle Bremen. This attraction is frequented by locals and tourists alike. Located in Mitte, this hotel is within 2 mi (3 km) of SpielBank Hannover, HDI Arena, and Hannover Zoo. Hannover Congress Centrum and Maschsee are also within 2 mi (3 km). Central U-Bahn is 7 minutes by foot and Sedanstrasse-Lister Meile U-Bahn is 12 minutes. Located in Mitte, this hotel is within 1 mi (2 km) of Schauspiel Hannover, HDI Arena, and Maschsee. Hannover Congress Centrum and Hannover Zoo are also within 1 mi (2 km). Aegidientorplatz U-Bahn is 8 minutes by foot and Marienstrasse U-Bahn is 8 minutes. Located in Mitte, this hotel is within 1 mi (2 km) of Ballhof, HDI Arena, and Maschsee. Sea Life Hannover and Hannover Congress Centrum are also within 3 mi (5 km). Steintor U-Bahn is 5 minutes by foot and Koenigsworther Platz U-Bahn is 9 minutes. This family-friendly Hannover hotel is located in the entertainment district, within 1 mi (2 km) of Eilenriede, Hannover Zoo, and Hannover Congress Centrum. HDI Arena and Maschsee are also within 2 mi (3 km). Central U-Bahn is 8 minutes by foot and Hannover Central Station is 10 minutes. Located in Mittelfeld, this luxury hotel is within 1 mi (2 km) of Expo Museum, TUI Arena, and Hannover Fairground. Expo Park and Hannover Convention Center are also within 1 mi (2 km). Laatzen Hannover Messe-Laatzen Station is 27 minutes by foot. Located in Mitte, this boutique hotel is within a 10-minute walk of Opera House and Marktkirche. New Town Hall and Schuetzenplatz are also within 1 mi (2 km). Kroepcke U-Bahn and Steintor U-Bahn are within a 5-minute walk.